It's not that long ago that Queensryche without Chris De Garmo and Geoff Tate would have seemed unthinkable. 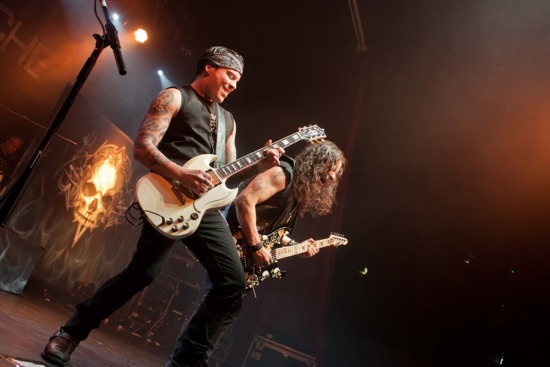 But with De Garmo well and truly replaced and Tate's version of the band gaining only mediocre reviews, Queensryche, with their first headlining UK tour in several years, had the opportunity to cement their reputation with a fine album already gaining the upper hand on Tate in most eyes. First, however, we got Welsh quintet Triaxis. With two albums already under their belts, they served up a solid display of heavy metal riffing in classic Maiden and Priest style. Lead by the powerful vocals of Krissie Kirby and the twin guitar attack of Claire Wilson and Glyndwr Williams they raced through a quality set of songs with Krissie an engaging frontwoman lifting them well above your run of the mill metal band. Already favourites at Hammerfest and Bloodstock festivals, album number three could be one to look out for. Local band Absolva rose from the ashes of Fury UK following bassist Luke Appleton's departure to Iced Earth. With debut album 'Flames Of Justice' getting positive reviews all round and a new live album and DVD already out there, Absolva are aiming high and hitting the mark every time. Currently operating as a three piece after the loss of their rhythm guitarist, Chris Appleton continued where he and drummer Martin McNee left off with Fury UK with outstanding lead work and some powerful vocals. Dan Bate handled bass and backing vocals and along with McNee ensured that there was no let up when Appleton showed off his shredding prowess. This is a British metal band that should surely be on stages such as this as headliners in their own right in years to come. 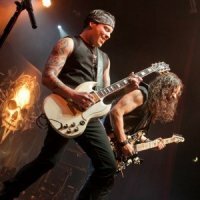 So did Queensryche with new vocalist Todd Le Torre deliver? Too right they did! With a set based around their first five albums, along with a few from Todd's debut, this was back to the roots stuff and both band and audience seemed delighted and re-energised by it. Opening with 'Queen of the Reich' Todd immediately blew away any concerns about his ability as a replacement for Tate. 'Speak' from Mindcrime was up next before 'Walk In The Shadows' and 'The Whisper' followed with barely a chance to draw breath. Quite rightly, all eyes were on Todd, but don't forget the quality on display here from original members Michael Wilton, Scott Rockenfield and Eddie Jackson. The backbone of the band remains as strong as ever and freed from the conflicts with Tate that have seemingly been ongoing for years, there's a freshness and vigour in the performance which to be honest surprised – and delighted – me. Todd Le Torre though is a huge find; not only does he match, if not better Tate in the vocal stakes, but engaged the audience throughout, prowling every inch of the stage, relating to every corner of the crowd. Songs from the new album 'Where Dreams Go To Die' and 'Fallout' sat comfortably alongside the classics of 'Walk Into Shadows', 'Warning' and 'Needle Lies'. We also got a first ever live performance of 'A World Without' before the main set reached a climax with 'Eyes Of A Stranger' and 'Empire'. Encores of 'Jet City Woman' and 'Take Hold of the Flame' close the night on a real high. The size of the crowd in Manchester was a little disappointing, but those who did attend were well rewarded. Hopefully the word should spread – this was a band revitalised with a new vocalist and the fire back in their bellies. The only losers tonight were the doubters who stayed away.